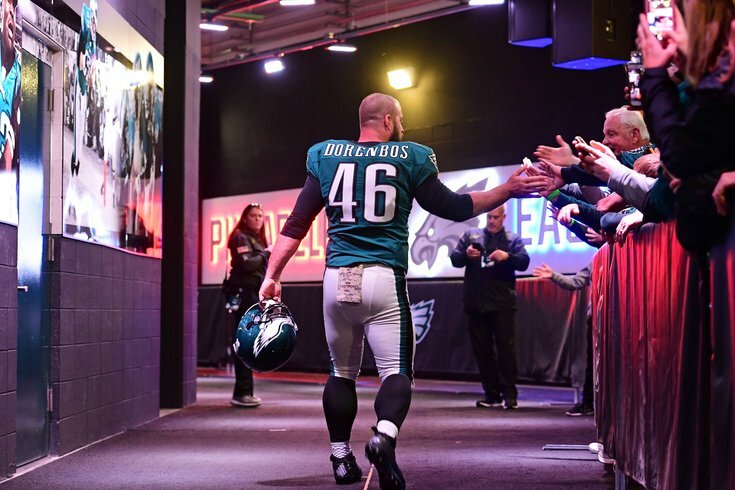 Jon Dorenbos' bond with Eagles fans remains unbreakable. His whirlwind life is back again, or at least a small semblance of it. Jon Dorenbos is able to perform his magic in front of large audiences, traveling the country and pacing himself. The beloved 37-year-old former Eagles long snapper got a chance to see a portion of the Eagles’ dominating 38-7 NFC Championship victory over the Minnesota Vikings walking through an airport on Sunday. Dorenbos, two-time Pro Bowler and 14-year NFL veteran, saw his old battery partner, Eagles’ punter Donnie Jones, get into it with some of the Vikings after an extra-point late in the game and across the country, Dorenbos laughed. On August 28, the Eagles traded Dorenbos, at the time the longest-tenured pro athlete in Philadelphia, to the New Orleans Saints. On Sept. 12, he underwent open-heart surgery by renowned Dr. Joseph E. Bavaria at Penn Medicine to repair an aortic aneurysm that was discovered during a routine physical. Now, he has an eight-inch-long vertical scar that runs down the middle of his chest and a renewed zest for life — which includes a strong rooting interest in his pals, the Philadelphia Eagles, to beat the Evil Empire of the North, the New England Patriots on Feb. 4 in Super Bowl LII. Dorenbos said he still keeps in touch with Jones, Nick Foles, Carson Wentz, and tight ends Trey Burton and Brent Celek. The finalist for America’s Got Talent admitted he doesn’t watch many NFL games. He spends time at the beach with his wife, Annalise, still does some work for the Ellen DeGeneres Show, and plays with his adopted service dog, Saint. He’s gradually getting back into a regular routine performing and has a date set up in Philadelphia at the SugarHouse Casino on Friday, March 16. “Overall, I’m extremely happy for the guys. Jeff Lurie was very, very good to me for a long time. I couldn’t be happier for him and the organization." “I love watching my friends; I’ll try and catch Donnie’s punts,” Dorenbos said. “This has been a huge life adjustment for me. I spoke to [Eagles’ owner] Jeff [Lurie] and Howie [Roseman], and it’s all good. I spoke to Doug [Pederson], and I can’t be happier for Doug. He’s a great coach and I loved him when he was with Andy Reid, and I loved for the short time that I got to play for him. Dorenbos says he feels well right now, though he loses his voice sporadically. His energy levels are uneven. They come and go. But he stresses that he’s getting better—and there is a chance that No. 46 could be in Minneapolis for Super Bowl LII. “I still have to take it easy,” he said. “I can’t lift any heavy things. There are things still going on that we have a year for this to kick in, because this went undetected for a long time. I need my heart to get stronger and it has a year to do that. Medicine changes by the minute. We’ll see. Jeff and Tina, his assistant, reached out to me about going to the Super Bowl. I’m just getting back into performing and I’m coming back to Philadelphia, which I’m really looking forward toward. There was a lot of things put on hold, because we didn’t know where my recovery process would be at this time.